Taking the debate on electoral reforms further, former BJP leader and senior journalist Arun Shourie raked up the issue once again. HYDERABAD: Taking the debate on electoral reforms further, former BJP leader and senior journalist Arun Shourie raked up the issue once again. 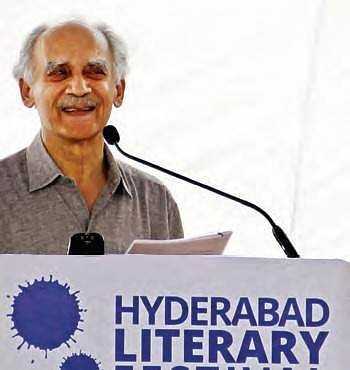 Speaking on Day Two of Hyderabad Literary Festival on Saturday, the former Union minister criticised the first-past-the-post electoral system being practised in India. Shourie revealed he is working on a book on an alternative process that can be put in place. In the present system there have been instances where political parties could not come to power despite securing higher percentage of vote share, he said. Shourie also made many veiled attacks on Prime Minister Narendra Modi from the dais. Comparing Modi to former Prime Minister during NDA regime, Atal Behari Vajpayee, he said, “Vajpayee appropriated failure and distributed success unlike how it is happening now. He did not have insecurities and gave everyone a chance.” While Vajpayee never claimed the success of government as his own, it’s different in the case of Modi where he claims credit for various government initiatives, said Shourie. Criticising demonetisation and the Central government’s talk on tax evasion, Shourie said that rather than tax evasion, the revival of private industries and structuring tax regime for that is need of the hour. This would create productive assets which, in turn, will provide employment, he added.